A new, urgent task of Samsung, the world’s unrivalled memory chip provider, seems to be developing chips for artificial intelligence applications on devices, including the company’s AI program Bixby on smartphones and connected home appliances, an emerging cash cow sought by many chip ventures around the world. Though belatedly compared to its major rivals such as Qualcomm, the South Korean tech behemoth has embarked on research and development of so-called “AI chips” with a goal of commercialization in the next few years, according to industry sources. “(Samsung) is in the middle of researching and developing several types of chips that will be capable of processing massive data from AI applications on devices, eliminating the need to communicate with cloud servers,” an industrial source from one of Samsung’s partners told The Korea Herald. Up-to-date handheld devices have made their debuts with AI features such as voice recognition and machine learning. Data produced during operations of such AI features is currently stored in cloud as a database and recalled when needed. The communications network plays a crucial role in enabling the AI applications. The forecast comes amid increasing efforts by tech giants and startups around the world to improve their performances of AI-powered devices. For global semiconductor manufacturers, AI will create new market opportunities, according to market intelligence firm TrendForce. With AI becoming a major growth contributor, the research firm predicts that the global revenue from semiconductor chip sales will annually grow by around 3 percent from 2018 through 2022. The Kirin 970 chip is described as the first neural processing unit for smartphones, which replaces a multiple number of chips for classic computing, graphics, image and digital signal processing. The separate chips take up more space and time due to interactions among themselves within phones. Huawei’s new phones will have a faster performance, more compact design and longer battery life than those of its competitors such as Apple and Samsung, according to Huawei’s smartphone chief Richard Yu at IFA 2017. 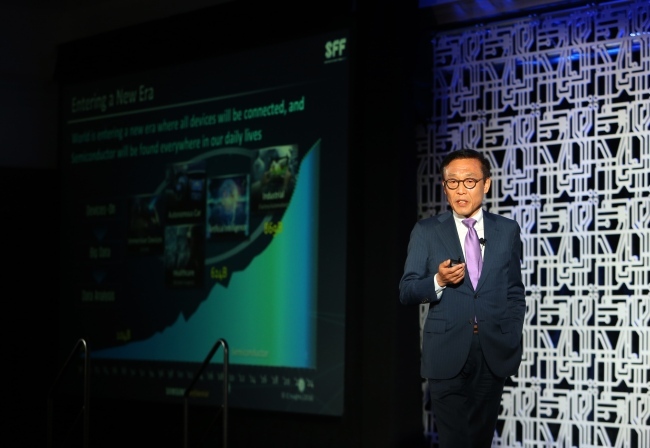 “Competition for AI chips is so intense globally that we will be able to see AI chip-equipped smartphones in the second half of next year,” said Yoo Hoi-jun, professor at Korea Advanced Institute of Technology. Yoo’s team grabbed global attention in August after it announced the “Deep Neural Processing Unit” which combines the existing convolutional neural network and recurrent neural network while consuming the least amount of power. Samsung officially hinted that the memory chip giant is also working on some AI chips similar to the concept of the NPU processor at a recent technology forum in Seoul. According to Kim, Samsung is yet to largely focus on memory-based technologies. “Considering that the degree of integrity of Samsung’s Vertical NAND chips is doubling every 2.5 years, we will be able to store as much data as in our brain in a single solid state drive 20 years later,” Kim said. The Korea Herald is publishing a series of articles dissecting the status and plans of South Korea’s leading semiconductor businesses that are shifting the shape of the global market. This is the third installment. -- Ed.